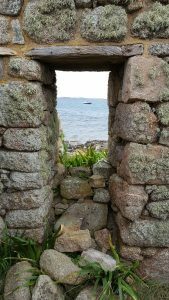 Blonde Two has already told you about our interesting journey to the uninhabited island of Tean (part of our Walk Scilly experience). When we landed on the shell covered beach we were in for a treat. We had no idea that such a small island could hold so much mystery and history. We visited a very early Christian Chapel remains including a graveyard, we climbed Great Hill (a little ironically named as it is only 40 metres above sea level) to visit a Bronze Age entrance grave and we entered (uninvited) the remains of a 19th century cottage. Our guide for the day was Dr Katherine Sawyer and she kept us fully informed of everything we needed to know about the tiny island and its antiquities. 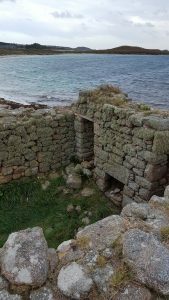 There are over a hundred uninhabited islands that make up the Isles of Scilly and this one, like the similar island of Samson, is full of interest and worth exploring further. It is fascinating to think that such small communities existed on what seems to be the tiniest, most remote locations. What’s also fascinating is that we know so much about these communities. 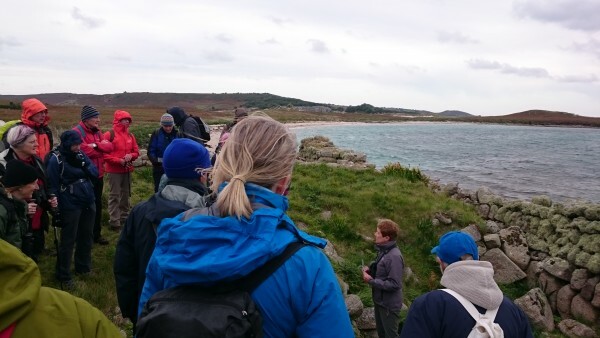 Long may this information be shared and enjoyed and thank you to the Walk Scilly team for making our trip possible. 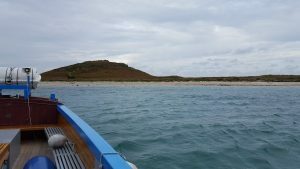 To discover more about the Isles of Scilly, go to www.visitislesofscilly.com. There are Skybus flights to St. Mary’s all year round from Land’s End and Newquay Airports, and between March and October from Exeter Airport. From spring to late-autumn, the Scillonian lll passenger ship sails up to seven days a week between Penzance and St. Mary’s. For travel information, visit www.islesofscilly-travel.co.uk. Accommodation: www.carntop.co.uk, www.star-castle.co.uk.